Proven in demanding commercial, military and luxury yacht applications around the world. 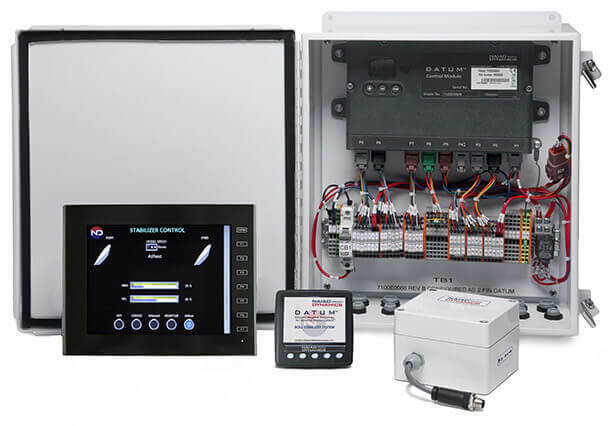 From our landmark Hydro-Mechanical Gyroscope (HMG), which set a new standard in yachting comfort and revolutionised the small yacht industry, to our advanced electronic Angle, Velocity, Acceleration controls, to the most sophisticated digital Ride Control Systems, NAIAD has the perfect control to match your system performance needs. NAIAD fin movement is commanded by a control system that senses the vessel’s motions and issues precise control commands to the rest of the Roll Stabiliser System in proportion to those motions. As the controller senses the slightest roll motion, the fins respond instantly and in exactly the proper proportion to neutralise the vessel’s tendency to roll, without over-or under-correcting. NAIAD fins stop rotating the moment the roll tendency has been neutralised, regardless of their position or the vessel’s speed at the time. NAIAD systems have been proven to automatically reduce roll motion by up to 90% over a wide range of vessel operating speeds. NAIAD systems are available to control vessel Roll while underway (“Active Roll Stabilisation”), to control Roll at zero speed (“Stabilisation AtRest”), and to control Roll, Pitch, Yaw and other undesirable vessel motions (“Ride Control”). NAIAD control systems may also be retrofitted to existing stabiliser systems (“Stabiliser Control Conversions”).